Business travel was never designed to be fun. Very often you find yourself rushing to an airport, getting off in another city, jumping in a cab, going to a hotel, meeting in the hotel’s conference room, jumping back in a cab, and the next thing you know you are sitting in the office. You may have just visited one of the most beautiful, culture-rich cities in the world and never even knew it. But the times they are a changin’. Many people who need to travel on business are becoming “bleisure” travelers, a term used to define professionals who mix vacation — or leisure — time with business. According to a BridgeStreet Global Hospitality report, 60 percent of travelers reported having taken bleisure trips, with 30 percent adding at least two additional days to their trip. Respondents said they do this because it limits the stress associated with business travel, making them more relaxed when away from home. And sometimes, it’s just to enjoy the city they are visiting. On a business trip, Caroline Michaud, a PR executive for a hotel group, opted not to do the traditional first plane out after finishing a business meeting in London. Instead she took the last flight out so she would have time to visit the National Portrait Gallery and Buckingham Palace. “I’m always seeing how you can stretch the trip,” she says. Even if it just means six extra hours in a city, she wants to do it. “You don’t have to stay extra nights to get the real feel of a city,” she says. 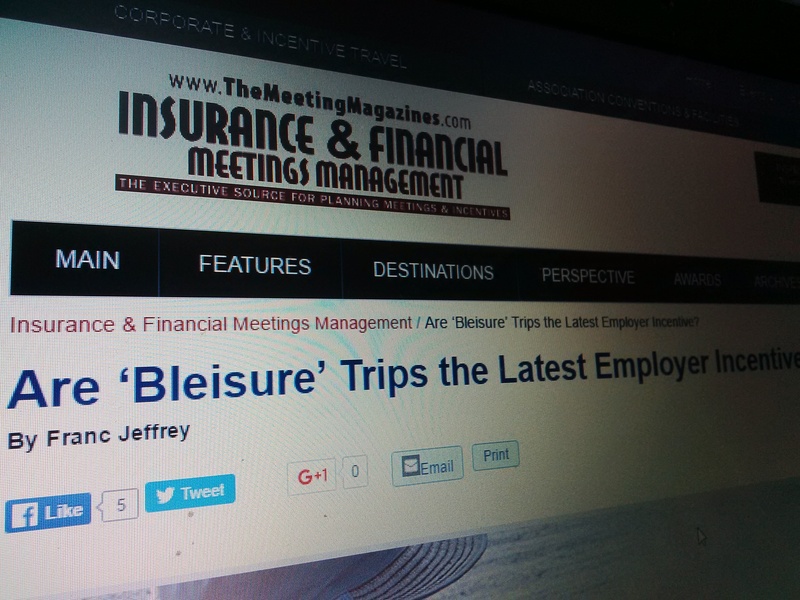 As a travel management company, we are seeing increasing amounts of clients extending their trips, and bleisure is fast becoming a way of life for the business traveler. Many see extending their work trips as a perk of the job. We find that when a business trip is extended with family or friends, the burden of travel is lessened and can make employees more willing to travel in the first place. We also have clients advising us that bleisure trips can be advantageous to the company as a whole, with staff gaining better knowledge of a city and its culture as being good for business. In a survey of international travelers published last year, 60 percent said they’ve taken bleisure trips, usually adding two vacation days to work-related travel. Nearly half of them did so on most occasions, and six out of 10 said they were more likely to take bleisure trips today than they were five years ago. “It makes the stress of business travel more bearable,” says Stuart Bruce, a British public relations adviser whose work frequently takes him all over the world. According to the BridgeStreet survey, bleisure travelers are almost evenly split between male and female, with most falling into the 45- to 54-year-old age group. More important, the second largest group was 25- to 35-year-olds, representing millennials. This always-on, app-connected generation is more apt to deploy a business-mixed-with-pleasure mindset. Tuned in to technology, they get comfortable in unfamiliar surroundings by using apps and social media to navigate, make connections and choose restaurants. Regardless of age, bleisure travel continues to grow: 60 percent of BridgeStreet respondents were more likely to take a bleisure trip now than they were five years ago, and 94 percent state they do so to gain cultural experiences and to explore the cities they travel to on business. Additionally, almost 55 percent of bleisure travelers bring family members with them, while about 29 percent said they haven’t yet, but would like to or are planning to. With all this in mind, it’s evident that bleisure travel is very much becoming part of the business travel world, but how is it managed? We’re still finding that many corporate travel policies don’t allow for gray areas such as bleisure. The biggest questions are — who pays for the extra nights’ hotel accommodation and the flights home? This all goes back to having a clear and concise travel policy and making sure it covers bleisure activity, otherwise extending business trips for bleisure would have to be decided by management on a case by case basis, and you run into the danger of a staff member feeling slighted that their bleisure trip isn’t paid for while another staff member’s is paid for. But, as a business, what do you need to consider? First of all, if your staff is on business they would have to fly home anyway, so we would always advise that travel policies state the flights home are paid for by the business, as long as there is no substantial increase in price. The accommodation costs are usually the main issue, however we find these are usually negated by less expensive “off peak” weekend flights, for instance business flights on a busy Friday night usually come at a premium, whereas on a Sunday afternoon these flights are less expensive, and most businesses are happy to offset this cost on the extra nights’ hotel accommodation cost. Each company has its own policy for adding on personal time. “It’s one of these gray areas,” said Greeley Koch, executive director at the Association of Corporate Travel Executives, in a recent interview in The New York Times. “It really comes down to the culture of the company.” Some companies tend to discourage adding on vacation days. Others encourage it, if only to help employees overcome jet lag and be more effective while they work on the road. Employers are advised, for example, to warn business travelers of any known dangers in the immediate vicinity of their business travel in case those dangers are encountered on leisure or tacked-on time. In addition, some countries have adopted stringent employer duty-of-care legislation or case law precedents that generally apply to that company’s employees traveling in other countries. That being said, it is important to work with a travel management company that knows not only the rules governing travel in each country, but where the “hot spots” are that should be avoided should an employee decide to extend his business trip. All indications are that bleisure will continue to be a corporate buzzword, particularly as business travelers start to skew younger and younger. But no matter the age of the business traveler, more and more will be looking to roll some pleasure into the workload, which means businesses have to not only adapt to this trend but also turn it to their advantage when recruiting new workers and attempting to retain current ones.